Twitter has a way of making me read books I would normally never pick up, I just really like participating in twitter chats! 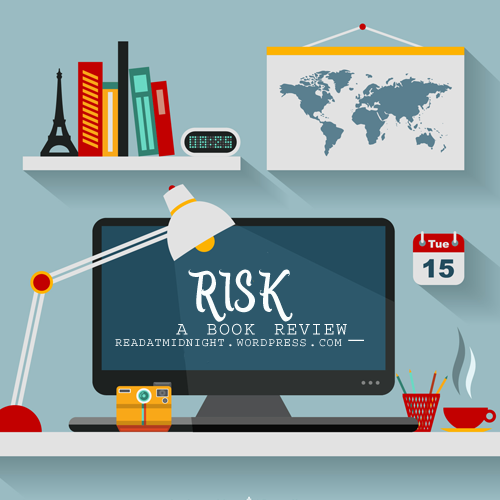 When I heard that the newly established #bookclubaus’s August pick was Risk, I went to purchase a copy promptly. While I really appreciated the main message in the book and ultimately found it emotionally tight, I did have a couple of problems as well. 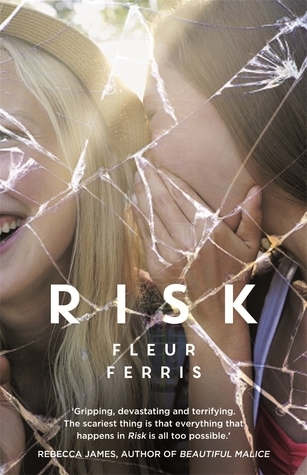 At first, Risk starts out unnervingly like a typical high school drama – and while I love watching Mean Girls – my tolerance for this type of fiction is low in my old age. Thankfully, the frenemy plot soon got left behind and Risk started to confront larger issues. Risk mainly looks into the danger of catfishing and victims of internet dating scams. Taylor and Sierra are best friends from childhood, they love one another, though Taylor can’t help feeling that Sierra’s life is too charmed, too perfect. They were both approached by a charming guy on a chatroom, though he ultimately chooses to take Sierra out on a date, leaving Taylor envious and hurt. However, the story takes a dark twist when Sierra does not return from her date. The plot deals with Taylor’s guilt: for being envious of Sierra, for having such horrible thoughts of her friends just before she went missing, for not recognising that they were being groomed by a sexual predator. It also deals with her grief of losing a best friend. The mystery of finding the culprit of this crime also played a brief role in the plot. However, the main crux of the plot deals with raising awareness for cyber crime, rather than trying to solve this specific one. I wish that I did not go into this expecting a thriller, as my expectations were drawn up short. I really felt for Taylor as she lost her best friend, I also somewhat related to her envy of Sierra initially – we were all 15 once, after all. However, I did not like how this comparison between herself and Sierra dominated her thoughts – especially when they were mostly concerned about the physical: e.g. how much make up Sierra was wearing, how much prettier she is, etc… All these insecurities were never answered during the book. I did like how involved the parents were in this storyline. Both Taylor and Sierra’s mum played an important role in the book and in Taylor’s emotional arc. As always, I appreciate the inclusion of family members as they’re so often brushed aside in young adult novels. Another thing I enjoyed was the relative lack of focus on the romance. The story told definitely highlighted Taylor and Sierra’s friendship, and Taylor’s coming to terms with the dangers of the internet. However, I felt that all of the side characters were really underdeveloped, not wholly unexpected in a 300 pages long book, I guess. An issue I had with this book was the simple, direct, style of writing. It left me a bit detached from the events which unfolded, though I felt I should have been a lot more affected. It felt a bit more like a report telling me of the events, of how Taylor is feeling, without really showing me anything. I will say that it makes for a very quick read. The writing was also gripping enough to finish it in a single 2-3 hours sitting. Maybe it’s easier to criticise Sierra. Maybe if it was her fault – if she did something wrong – it would be easier to make some sense of what happened. But the cruel truth is, what happened to Sierra could have happened to any one of us. I did appreciate that the book raised awareness on all of the potential stranger danger of this current age. Loads of people own multiple forms of media, heck, as bloggers we should understand more than anyone how easy it is to trust and love people online. However, be cautious is always a good idea, as you never know who might be behind that computer screen, and sadly the tragedy in this book is too commonplace in real life. All in all, it was a great debut novel by an Australian author. I actually loved it after my initial read through 2 weeks ago – but thinking back on it, I had issues with some of the writing and portrayal of teen drama. However, if you’re looking for an emotional and gripping contemporary, this one will fit the bill! Next ›Discussion: How Much Realism Should We Expect From Fantasy Fiction? Haha some people in older age group still enjoyed it, after all the author is well above 25. But if you for like teen jealousy and drama I would probably steer clear. Thanks Nicola! But yes forget about this book if you are short on funds, The Fifth Season is definitely where it’s at this month haha. Most probably because I’ve been quite busy myself so I only get to go online every few days to comment (I mean okay, late reply here). I AM planning to review more books, although I’m still half-half in terms of HOW to do it, since my thinking is influenced by my belief. I know I should just go for it but I’m still waiting for some kind of nudge. Let me be the nudge Nurul and convince you that I need to you to join me in the world of blogging on books hehe. Hope that real life eases up on you soon! I really miss you!! And behave missy with your parents out of the home eheheheh. I found the movie and TV show Catfish very interesting – I might pick this book up. Thanks for finding an interesting book outside of normal SF&F! Thanks Alicia! I hope you enjoy this one. I try venture out of SFF once or twice a month. But I always quickly come scurrying back haha. I’ve been meaning to pick this up for the book club but I keep forgetting! I’m kind of glad to hear that it’s not a thriller, because I’m really bad with suspense and thrillers. Ooo it’s a really quick and breezy read , the bookclubaus is next Friday so you have plenty of time. DO IT! Twitter chats are the best, you make loads of new bookish friends. Twitter is such an enabler. It’s good to hear that Taylor’s parents were a big part of the story, because like you said family seems conspicuously absent in a lot of YA. I’m usually not a big reader of ‘issue’ books but I often find myself recommending them to the teens who come into the library – it’s important for them to know how to be safe online! You’re a librarian, Danya? Awesome! I would totally recommend this book and All The Bright Places to teen readers. I don’t read many contemporary but the emotions of both these books were great. And yes twitter why do you torment me!! Haha. Mmm, it sounds interesting, although I’m not a fan of reading about younger protagonists. That said, great review! Thank you!! I can’t do very young narrative voices either as I can’t really relate to them anymore. I say this. Though I will still be BFF with 11 year old Hermione ahahah. I’m hesitating on if I want to read this, based on your review. It sounds interesting, but I struggle to get absorbed in a book with that straight-forward writing style like you described. I’ll definitely check it out, though, and see if I can find a preview of the first chapter or so to see how the writing works for me! I think that while the book had weighty themes the writing is a bit sparse. However it still made for an engaging read. Maybe a library book rather than a purchasing one! Great review Aentee! I had a few issues too with feeling like I was a little old for the book, but it was an enjoyable read nonetheless. Thanks so much for taking part in the book club!